A trip to Haberdish is an experience to be had; an absolute treat from start to finish. 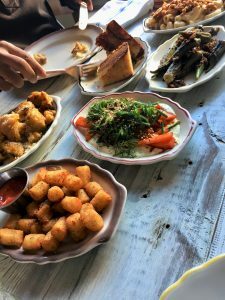 From its humble industrial-ish decor to the comforting grandma-esque plates the food is served on, the whole experience is a bowl of comfort in my happy place. 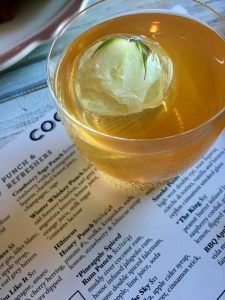 On each of my visits, Haberdish has proved to be an absolutely perfect dining experience. It is something one has to experience for themselves to fully comprehend what I am babbling about. I am going to dive in head first to the things one consumes, because I have had plenty of it and because I have plenty to say about it. The cocktail menu is avant-garde and seems to change with the seasons. All drinks are hand crafted with the most unique and beautiful details, some as delicate as a beautiful rose bud perfectly encapsulated in an ball of ice. The decorations are not merely for looks, as they compliment and are a part of the composition of each cocktail in the most ingenious of ways. The menu is divided into 4 small sections. Family dining is encouraged and I found it to be a great suggestion. Starting with the “Snacks”, the smoked deviled eggs seemed to be popular on the tables surrounding mine and rightly so. A velvety yolk deliciousness fills the egg whites which are lightly smoked. The smokiness is not overwhelming but certainly makes a statement. This is an excellent starter dish. Hushpuppies. How Do I love thee? Let me count the ways. Hushpuppies are a must on my plate when I am having southern cuisine. These were not dense. They were crisp on the outside and surprisingly fluffy on the inside. I have had my share of dry hushpuppies and these were not that. They are served with a side of sweet tea butter. Need I say more? “Entrees” include something for everyone. I tried the fried chicken and it was perfectly cooked. The batter is lightly seasoned and the taste is simple and clean. It was not heavy or thick and it did not crumble off when handled. My pieces were piping hot so I waited a bit to dig in. I am not sure how they do it but the crust maintained its intense crunch throughout, even after letting it sit. Not one part was soggy. I also tasted the cast iron NC trout, a large filet which was fresh and beautifully prepared. On to my favorite part of the menu: “Sides”. I have often thought that it would be nearly impossible to have every item ordered at a restaurant be on the same level of awesome. Well, I was wrong. I truly cannot single out one dish as better than the other as everything was exquisite. All sides were plated like they came right out of the pages of a magazine. To name just a few, the Charred Okra with bacon jam was incredibly tasty. I could have had this dish all to myself and then licked the plate. The okra is charred whole on a cast iron and then topped with a salty, sweet bacon jam that I wish they would jar and sell. The Savory Corn Bread Pudding is out of this world! It is rich and savory with a hint of sweetness. The gruyere and herbs add a pleasantness to the dish that leaves you wanting for more. The Mac & Cheese was smooth and creamy with large macaroni that were thoroughly coated in the cheese sauce. I opted to top it with the spicy crunchy chicken skins which was brilliant. Lastly, the BBQ Glazed Carrots served over ranch chèvre. Honestly, I did not think much about this dish until I saw it on the plate. What a gorgeous dish! 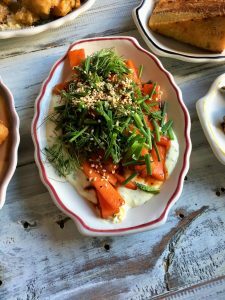 The bright orange and green colors of the vegetables were tantalizing and I found that the flavors meshed together perfectly. For dessert, the Waffle. 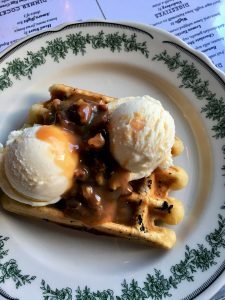 It is described as a pearl sugar waffle topped with house buttermilk ice cream and a pecan caramel. I find that the description only begins to paint a picture of what this dessert truly is. This is not just a waffle. It looks like a waffle but it did not taste quite like a waffle to me. It is so much more. The waffle is buttery, similar in flavor to a croissant crossed with a yeast donut. Like a traditional waffle, it was served warm and crisp. The pecan caramel was warm, sticky, buttery, salty and sweet. Two scoops of tangy and faintly sweet buttermilk ice cream completed the whole thing. It is like an explosion of flavors in your mouth. Spectacular! Lissette Grillo is a Miami native who was raised heavily on Latin-American cuisine. She moved to the Charlotte scene in 2005, where she discovered life outside of palm trees and pastelitos. Lissette is fluent in Spanglish, movie quotes and song lyrics. When she’s not eating her way though the Queen City, she is helping moms feed their babies as a lactation consultant. She’s all about food! Tagged American, Breakfast, Casual, casual attire, cocktails, desserts, dinner, family style, Farm to Table, Full Bar, Good for Families, good for groups, Good for Kids, lunch, Open Late, Southern. Bookmark the permalink.